Duck Dynasty stars come to Morgantown, West Virginia, on Saturday, September 21st. 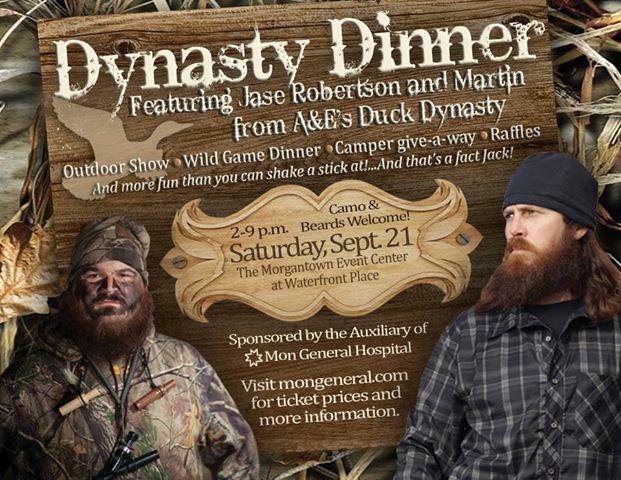 Jase Robertson and Justin Martin of Duck Dynasty will join the Auxiliary Of Mon General Hospital at the Waterfront Place Hotel and Morgantown Event Center. Dine at the Wild Game Buffett and see the Outdoor Show. Everyone is registered for the door prize… a new camper! Tickets go on sale June 10th by calling 304-598-1324 or, get Duck Dynasty Dinner tickets this Saturday in person at the Waterfront Place Hotel. Proceeds benefit patient care at Mon General Hospital.